Essential oil diffusers distribute the aroma of essential oils throughout a space. They come in many varieties, each of which works in a unique way to diffuse the oil through air and create a pleasing aroma in your home. While it is possible to create a homemade diffuser by placing a few drops of essential oil on a tissue, the warmed wax of a candle, or in a stove pot, a true diffuser can help to distribute the scent through the air far more effectively. Each type of diffuser has several attributes that makes it ideal for specific uses. A lamp ring diffuser is a simple and inexpensive way to diffuse aromatherapy and essential oils in your home. To use this type of diffuser, you place a terracotta or clay ring with a channel in the top for holding the oil on a light bulb. When the bulb heats the ring, the scent of the oil is distributed through the surrounding area. You can use these diffusers with any standard sized lamp and light bulb, which makes them simple to use and store. You can find lamp rings nearly anywhere, including Starwest Botanicals, and they come in a variety of colors and materials, such as enamel, metal or clay. Clay pot diffusers come in multiple shapes and sizes. They are typically made of terracotta, a porous red clay that absorbs the oil from within and distributes it through its surface. They are unobtrusive and fairly ornamental, and you can place them anywhere. 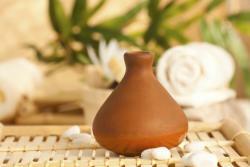 Most clay pot diffusers are small and resemble a corked jug. You can also find them shaped as birds, angels or other shapes. 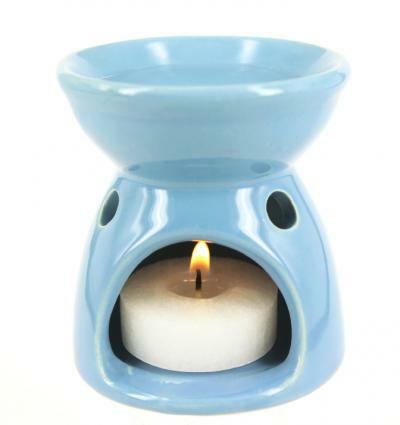 Candle diffusers are typically one- or two-piece diffusers that consist of a base and a reservoir for the oil. You insert a candle in the base, either from the side or from the top. The flame warms the reservoir, dispersing the scent of the oil through the room. They come in many decorative shapes and sizes and can be used anywhere that a candle can be used. Materials consist of soapstone, terracotta, glazed clay and more. There are two types of electric diffusers: electric fan diffusers and electric heat diffusers. Both use electricity to power a fan that blows across the surface of the oil, dispersing its scent. Electric heat diffusers first warm the oil, producing a slightly stronger aroma. Electric diffusers are less ornamental than clay or candle diffusers. The most unobtrusive plug directly into the wall, while others resemble humidifiers. You can use electric diffusers anywhere there is an electricity source, including your car, which makes them extremely versatile and safer to use than candle flames. Check out New Directions Aromatic and Aroma Thyme for a wide selection of electric diffusers. Nebulizers are a different kind of electric diffuser. They utilize electricity to diffuse the oils but work in an entirely different way. The nebulizer breaks down the essential oils into particles that it then spreads through the air in a fine mist. This mist is further reaching than many other forms of diffusers, giving more potent results. If you are interested in inhaling the essential oils for health benefits, rather than simple aromatherapy, a nebulizer will enable you to get the best results. Most nebulizers consist of the main unit, which resembles a humidifier or a small motor, and a tube leading to the output device. The output device has an opening at the top for the mist to escape from. Some, like the natural wood model from Synergy Essentials, have a more decorative element to them as well. Before you buy an essential oil diffuser, make sure you consider what benefits you want to receive from the device. If you're interested in occasional use for the benefit of scenting the air, a lamp ring may be your best choise. On the other hand, a nebulizer may better suit more frequent use for a variety of purposes. Weigh your options carefully before buying to get the diffuser that meets all your needs.